Published on April 27, 2010 in COP, Elections, International, Law, Media, NJAC, People's Partnership, PNM, Politics, Security, UNC and USA. 9 Comments Tags: American Embassy, Henry Bernard Campbell, Jack Warner, Kamla Persad-Bissessar, Keith Rowley, Martin Joseph, Patrick Manning, Politics, T&T Govt. Unless and until the Minister of National Security can convince us differently the following has to be said. Bernard Campbell was not allowed to enter the country because the PNM was afraid that he would successfully help the UNC coalition win the election on May 24. We have to ask, first and foremost, what was the thought process, if any, behind the refusal to allow Bernard Campbell to enter the country last week? Obviously a decision was taken, although at first everyone in government was “breaksin” from any responsibility, or even knowledge of the event. Clearly someone in authority had instructed — first the airlines, and then the Immigration at Piarco — that Bernard Campbell should neither be allowed to board an aircraft bound for, nor be allowed to enter, Trinidad and Tobago (TT). BOWING under pressure over his unexplained decision to use a rarely-used section of the Immigration Act to deny entry to UNC campaign adviser American Bernard Campbell, Minister of National Security Martin Joseph yesterday announced the ministry has cancelled the ban which prevented Campbell from entering the country last week. UNC political leader Kamla Persad-Bissessar last night called on Government to issue a formal apology to American political strategist Bernard Campbell, his family and the US government regarding his recent denial of entry into Trinidad and Tobago (TT). Meanwhile, the release revealed “the facts” regarding Campbell’s denial of entry. 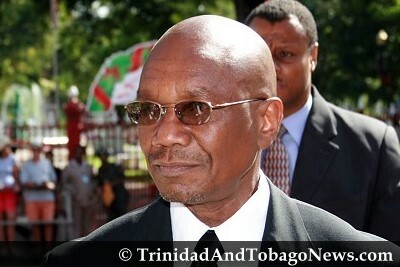 Slamming the Patrick Manning administration’s ‘bullying tactics’ and ‘high-handed action’ which saw Campbell’s deportation last Friday, Persad-Bissessar called on Government to state why Campbell was deemed to be an ‘undesirable’. Kamla: What made Campbell ‘undesirable’? The Ministry of National Security wishes to advise that the Rejection Order against United States citizen Mr Harry Bernard Campbell has been cancelled. I am not in favour of foreigners getting involved in our local elections (not like if they can be stopped). The US government either overtly or covertly interferes in elections in a host of countries in order to get leaders who are more compliant. The US government may not see Trinidad and Tobago as warranting their intervention, either directly or though their government-sponsored NGOs, except if they felt Abu Bakr stood a chance at winning an election here. They believe that the ruling PNM government and major opposition parties are more than willing to kowtow to the US government. There is nothing to convince them otherwise. This present government seems hell-bent on bringing foreigners to do work here as if locals either cannot do the jobs or be trained to do them. There is this colonial belief that foreign automatically means better. I believe a foreigner was also recently placed at the head of WASA. Given the government’s pro-foreigners policy, I think it was first hypocritical of them to ban Bernard Campbell from this country. More significantly though, it was an abuse of power to do so without justification. Abusing power seems to be the hallmark of this administration. I do not believe that Campbell can serve any useful purpose here other than a psychological boost to the colonial notion that being aligned with US personalities equals a superior campaign. The UNC could be banking on the colonial mindset that still grips this country. The fear of war (an extreme thought) should be the reasons why Trinbagonians should assimilate to one norm. Who will bring about that change? Socially it seems that too many people searching for their own identification are masquerading as their ancestors rather than moving forward with their current realities. I have stated (perhaps not well enough) about the risk of having foreign advisors (Heru also touched on the subject) assist in domestic elections. Some countries see the destabilization of a nation as an excuse to sweep in and consume resources. I can tell you one thing and that is if we don’t truly unite, we will lose control of the country. Every country that has had a civil war and the United States had some interest in that country, that country has lost control of it’s resources and sovereignty to the United States. If a civil war were to break out in Trinidad and Tobago, the United States would relieve the Mighty Sparrow from his take over. TNT is the seventh largest exporter to the United States in the Western hemisphere. Osjen says that the Prime Minister has been deliberate in the killing of the Indo Community. I say that you’re all Trinbagonian to me if you want to be. You sound as if you want a war. That would be disastrous to all except for the United States. It’s not like the United States favors the Indo Trinbagonian demographic over any other outside of creating a situation that would make it easier for them to take over. Assimilation is a key aspect to the future of Trinidad and Tobago not civil war. Osjen, I agree with you. I believe it’s inevitable even though I do not see it from your Indo perspective, I do see ‘Sande Grande’ throughout Paradise, don’t matter which way this election swings. The architect of this system (Burnley and co.) time is up.. Media is no longer for the privileged few Osjen, they never this far. But since Kamla love Bob’s music… I have one for her. YES I RECALL THE UNC PLAYING BOB’S “ONE LOVE” DURING THE 1995 ELECTIONS, AFTER THEY GOT POWER IT WAS PURE HATE WITH THE WITCH HUNTS CHASING OUT AFROS AND REPLACING THEM WITH INDIANS IN STATE RUN AGENCIES ETC. In most parts of the world that’s called “affirmative action” to represent the under-represented section of the population which forms the largest group. In any case, when the PNM was ironically selected by Robinson to form government on moral grounds they followed the same path and removed all the Indians. Even today they continue to ignore the majority Indian population as they make governmental appointments and offer scholarships. It is time for this type of governance to end. The reality is that race-based parties will continue to practise this sort of purge after every election. The coalition formed to fight the PNM is the sensible way to go.If the coalition is successful, let’s hope that the UNC leader acts wisely and makes the government truly representative of the people and the coalition which she was successful in forging.The PNM cannot continue to ignore the population composition of T&T as they bury their heads in the sand and try to govern like they did many years ago. The PNM cannot also continue to deny the aspirations and ambitions of the largest racial group in T&T.Race based politics should be sent to the political cemetry to join Panday. Ok Tman, but first we need a clear definition of the term BLACK POWER from ‘our’ Chief Servant and how it will play out in this unity ting. I see some are getting skeptical bout this unity ting, maybe they see what’s coming down the pike, but I guess only time will tell. It looks like the world is watching this time around so if things should probably be different. Also, Kamla is different. She has good intentions and wants a UNited TNT. Last time it was just a power grab. We may never know why the Minister of National Security, Martin Joseph, on Monday rescinded his original order banning the entry on Friday of United States campaign strategist, Bernard Campbell, when he flew into Trinidad and Tobago to work on the United National Congress’ (UNC) election campaign. Inferring that Campbell was “likely to be an undesirable” through the invoking of Section 8 (1) of the Immigration Act, Chapter 18:01 may have been designed, inter alia, to hurt the image of Campbell, who is known internationally, and served as a key strategist in the election campaign for then US Senator Barack Obama in his successful bid for the Presidency of the United States. We would like Minister Joseph to state yes or no whether, as alleged, the denial of entry to Campbell was an attempt by Government to adversely affect the UNC/COP Unity Accord campaign leading up to the scheduled May 24 General Election. Political Leader of the UNC, Kamla Persad-Bissessar, stated following on the rescinding order that the treatment of Campbell was “really a blatant act of intimidation and harassment”. What strikes as particularly odd, however, is that the ruling People’s National Movement (PNM) which the Accord is seeking to displace has, according to unconfirmed accounts, reportedly retained the services of American campaign strategists to advise on its own election campaign. Was the rescinding of the Immigration Order by the National Security Minister an attempt by him, as Persad-Bissessar, has stated, “to do damage control”? Or had there been some degree of diplomatic pressure, overt or covert, exercised by the US Government? Many in the population voiced their disapproval of what seemed to be a very heavy-handed ministerial move. So heavy-handed was it, and so quickly did it backfire that, from the very outset, Minister Martin Joseph could be perceived to be scrambling from the back-foot.